Subways and buses rumble north and south, and elevators rocket workers to their day. But all of these motors mean little in New York. The Big Apple's real life is on foot. Block to city block, sidewalk to crosswalk, and on into parks with paths, New Yorkers do what they have to do on the run and in the open air. They meet, they argue, they transact business, and--during all of the above -- they eat. 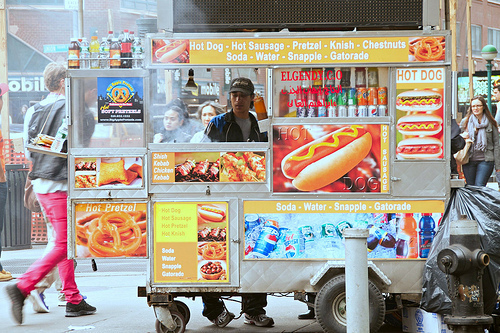 And what a smorgasbord of street treats do New Yorkers chow down on. Sabrett hot dogs with sautéed spicy onions and sauerkraut. Italian ices infused with tropical fruit syrups. Kosher-salted pretzels and roasted chestnuts in their shells. 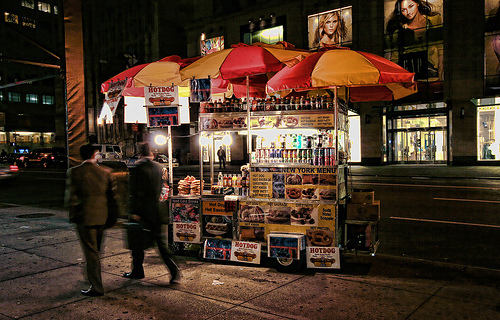 If you want to know New York, get to know its street cuisine. I learned it early. 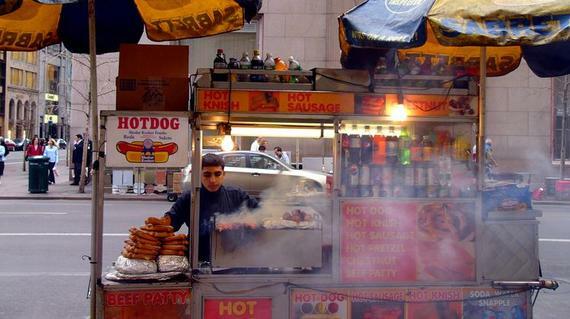 Growing up in Manhattan's Chelsea neighborhood, I would get a lunch of two hot dogs in steam-soft rolls from the guy who set up his stainless-steel pushcart on the corner of 17th Street every morning, rain or shine, Saturdays and holidays, summer-fall-winter-spring. In the half-shade of his blue-and-yellow umbrella (the official colors of the Sabrett Frankfurter Company), my friend would expertly brush on brown mustard, grab me an icy Royal Crown Cola, and, slamming cabinet doors, decorate the dogs with onions that his wife had cooked up at home. Even as far back as the city's Colonial days, street merchants were a fairly common sight, and in the early 1800s, many immigrants found their livelihoods through open-air vending. According to city lore, among the cut-rate foods sold near rivers and harbors back then was lobster--considered lowbrow at the time. By the 1920s, established Manhattan retailers were beginning to chafe at what they considered unfair competition from vendors, and a crescendo of complaints led City Hall to require vending licenses and limit these permits as well as the areas where pushcarts would be allowed to hawk their wares. City regulation reached a height of rigor during the mid-1990s, when the Giuliani administration began enforcing some long-ignored laws to keep "prime" midtown streets pushcart-free. Since then, the mayor's office and the police have backed off somewhat, though today's street vendors are regulated by both the Health and Consumer Affairs departments, and some are still smarting from being banished from favorite corners. A few vendors seem grouchy if you snap a picture or ask questions, but most are hard-working and remarkably friendly given the demands of customers, perishable foods, and -- for many -- trying to learn English on the job. Biting through the snappy skin of those Sabretts, savoring their simple smokiness set off by the sharp onions, is the best food memory I have, and since, no matter how many frankfurters I try, I can't come close to it elsewhere, it keeps me coming home. A while back, I took the train into the city for a day and struck off on an unofficial street food tour of Manhattan. My Sabrett guy is gone, so I walked around (and snacked) where the concentration of pushcarts is greatest: in midtown from Fifth Avenue west to Eighth Avenue, and from 34th Street up to 59th -- turf you can cover in a couple of hours or in an afternoon. Right smack in front of Penn Station, where my train pulled in, I ran into two pushcarts yoked together that were decked out with a flowery awning and hawking a huge variety of fresh tropical fruit. This was definitely not one of the nut-and-raisin vendors I used to see as a kid. The owner, Santosh, had fat mangos, papayas, and coconuts halved and arrayed on crushed ice. In between weighing fruit on a red scale and making change, Santosh showed me strange melons, bright yellow cherries, and a kind of stubby banana that looked too green to eat. "What is the most popular," I asked. "Your best seller?" This made Santosh laugh, but he said nothing. After buying a nectarine, I headed north in the direction of 34th Street, and suddenly I heard him shout: "Tomato! Tomato is best-selling!" I gave Santosh a polite wave and moved on. 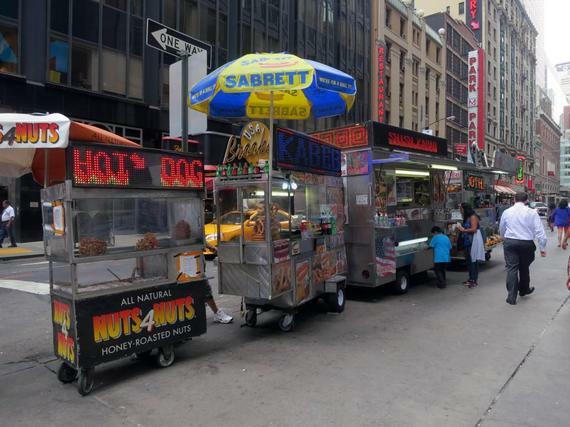 The blocks near Macy's were a hive of hot dog and sizzling sausage stands that looked and smelled like home to me, except that all of the orange umbrellas said "Citibank." Puzzling over this (does the bank finance the carts or is it an ad?) I ordered an Italian sausage sandwich and promptly dropped half of it on the sidewalk. Pedestrians made lightning-quick detours around the oily blob, and Ali, the sausage guy, let out a bone-tired sigh. "Every day I clean," he told me, pulling out a container of dishwashing liquid and a sponge. Pushing me aside, he went to work on the spot. "I'm sorry," I said, still hungry since I had lost half my sandwich. Ali shook his head, smiling like a parent with a messy toddler. 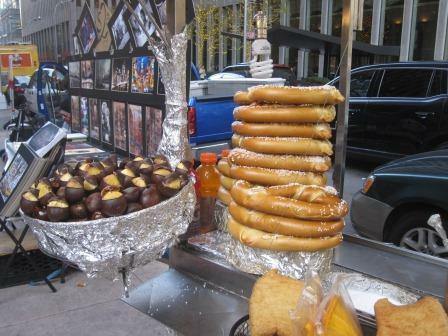 By the time I reached Bryant Park at 42nd and 6th, I was thirsty from the sausage and from my walk. A square of scraggly greenery next to the New York Public Library, this small park used to be a resting spot for drug users. Now it seemed scrubbed up with a scattering of Parisian-style metal chairs and office workers in shirtsleeves spooning yogurt and stretching out in the sun. I discovered where the yogurt came from: The park boasted a Ben & Jerry's ice cream kiosk on its northern fringe, and right next to it, a "Simon Sips" coffee stand where I spilled out some change for an iced tea. I was the only one ordering something this simple. Lattes and cappuccinos were set billowing on the bar to go with lunch plates from neighboring kiosks loaded down with "Focaccia Fiorentina" and "Pasta to Go." Where were my old favorites that I used to find in the park: Boxes of Cracker Jack with a shrink-wrapped prize? Good Humor vanilla cups with figure-eight shaped wooden spoons? "Penne rigate!" shouted a sign on one of the fancy kiosks. "With fresh mozzarella, chopped tomato, and basil - $6.75." One of the city's street food trends is snacks on the sweet side. 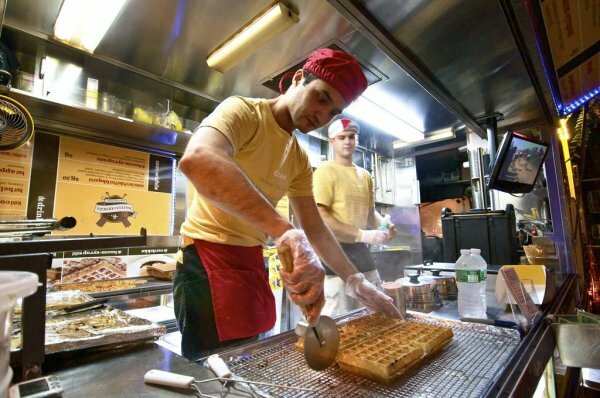 Trucks that sell cupcakes and crepes set up shop in busy parts of several boroughs, so I decided to take my chances on Fifth Avenue just south of Central Park. Sure enough, there was a glint of yellow at the corner of 59th across from the Plaza Hotel: a Wafels & Dinges vendor hawking Belgian waffles from his red, yellow and black truck--the colors of the Belgian flag. I walked up and ordered a Brussels waffle ($5) -- you can get extras like fudge sauce or whipped cream for an extra fee -- and a chewier Liège waffle for the same price. Waffles aren't my thing but both were much tastier than the childhood squares I remember pouring syrup on. 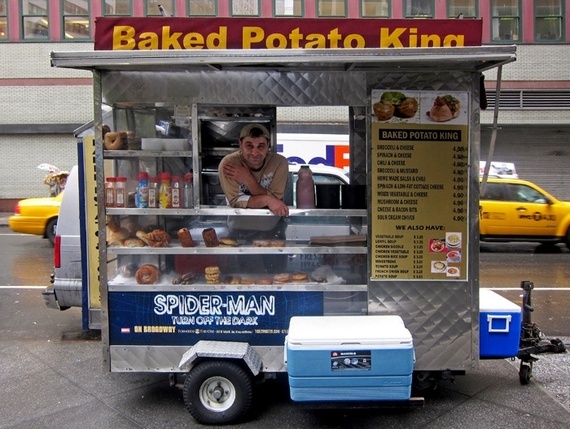 In quick succession I came across The Potato King, who specializes in stuffed baked potatoes on 45th and 6th, and Cynthia and Robert's Best Hero Sandwiches, across from the Time-Life Building on 50th. The Potato King, in particular, was having a bad day. "Business is slow," he said. "Better in winter. I sell broccoli and cheese, I sell chili and cheese. One day I sell 100 potatoes, just for lunch." I couldn't help much, but I did buy and taste a single cheese potato that turned out to be meltingly good. A nearby fruit vendor I tried to photograph became angry and started pelting me with both green and red grapes. "You give me one thousand dollars," he shouted, shaking his fist, "you can take photo! Otherwise, no." I apologized, and put my camera away, but he kept shouting, so I slunk off and tried to blend into the crowd. Equally uncooperative were a pair of Mister Softee sellers near Radio City whose trucks are outfitted on top with pointy horns shaped like ice cream cones. When I asked one of them whether there are any Good Humor men left in Manhattan--the pushcart guys with uniforms that I bought vanilla cups from as a kid -- he looked at me as if I were crazy. "You gotta be kiddin'," he cracked, letting out a low whistle. "Haven't seen one of those in 20 years. You want an ice cream or not?" I bought a raspberry-lemon Popsicle, although I was nearly full. On 43d and 6th I spotted a small white truck and accompanying stand that went by the name of "Healthy Halal." When I addressed the proprietor as `Mr. Halal,' he started shaking with laughter and passed the joke along to his three workers in a language I did not understand. "Halal means kosher for Muslims," explained the owner, Sammy Khan, who was from Pakistan and was still giggling. After a minute, he rearranged his face into a serious expression and, with a hand on my shoulder, alerted me to the fact that he offers "No falafel or fish." "That is fine," I replied, "I am not in the mood for falafel or fish," and ran my finger down a listing of Spanish-sounding foods. As it turned out, even these dishes were unavailable. "It is a rented stand," said Khan. "That is not my sign. But, here, I give you chicken with basmati rice to try. Do you like spicy? Yes? I tell you, you will like it. Always basmati, you see, on the bottom, because it is very light." Although by then I wasn't eager, I took just a small bite to be polite. Suddenly, I was awash in fiery flavors that exploded under my tongue and squeezed tears from my eyes. Maybe cumin, maybe coriander. Definitely peppery chicken, celery, chickpeas, and the fluffiest of rice. Whatever it was, I couldn't stop forking up more, waving my plastic utensil with amazement. Swallowing spicy chicken, I didn't notice the midtown traffic, the bus exhaust, or the pushing crowds. I didn't care that I was standing on a sidewalk between a parking meter and a sign that said "Tow Zone." "You are more hungry than you think," said Khan. He was right. I was hungry for street food. Hungry for Manhattan. And I didn't spill so much as a drop.